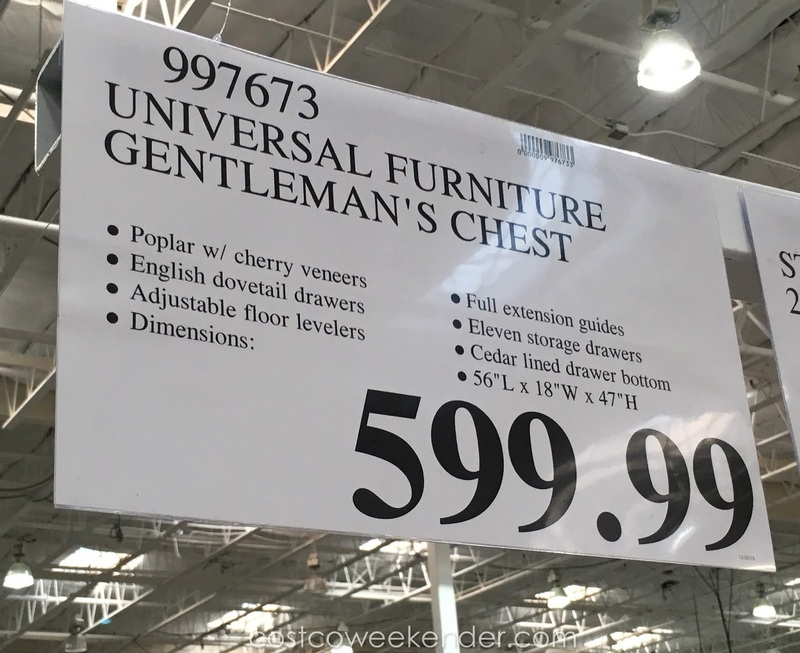 Bring valuable extra storage to your bedroom with the Universal Furniture Broadmoore Gentleman’s Chest at Costco. Ample storage and practical features make it a perfect choice for today’s living. Made of poplar solids and rustic cherry veneers, this classic piece features 11 storage drawers and full extension guides. 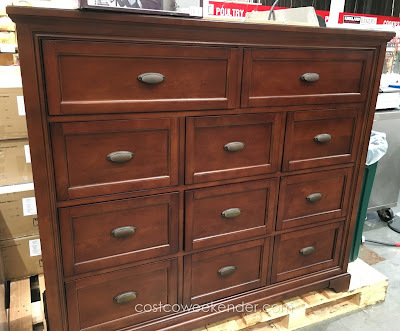 Whether you are storing clothes, watches, belts or other accessories, you’ll find the Universal Furniture Broadmoore Gentleman’s Chest a good buy for what you get and a dresser with a distinctive classical look that will go with any décor. Hello @Anonymous, thank you for your review for the Universal Furniture Broadmoore Gentleman’s Chest. Although I don't doubt the symptoms and problems your family has had as a result of this piece of furniture, the thing is a lot of furniture are probably made in China. I'm sure a lot of banned chemicals can still be found in these products and in everyday items in many people's homes. Some people may react differently and may experience symptoms as severe or none at all, but in either case I hope you and your family get better soon. 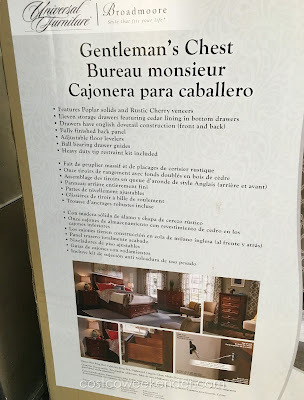 Bought an almost identical Broadmoore Gentleman's chest at a Central Valley Costco this July 2016. Unfortunately, in a box one cannot see if the drawers open and shut straight out. Mine has 2 drawers that stick out on one side father than the other. Trying to fix the problem, one finds an abundance of shims behind the glides where the manufacturer tried to do the same. Looks like I have a new hobby as this thing is to big and heavy to take back. Hi @JB, in general it's tough to determine whether you got yourself a winner or a lemon anytime you buy something that is packaged and/or boxed up. It's just the luck of the draw I guess. 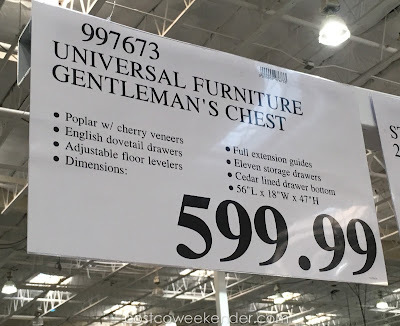 Ya, I don't blame you for not wanting to return such a bulky item in which it'd be such a hassle to do so, but I hope you're able to fix your Universal Furniture Broadmoore Gentleman’s Chest. Good luck! It does have a strong smell. I have refinished furniture using stain and varnish. It has never smelled this bad or lingered for so long. I am so glad this is in the spare room. I could not sleep in there. If it was easier I would take the entire set back also. The furniture is beautiful but the fumes are horrible. I have had it for a week now and the fumes can still make your eyes water. I should have paid more attention to the comments people were making. 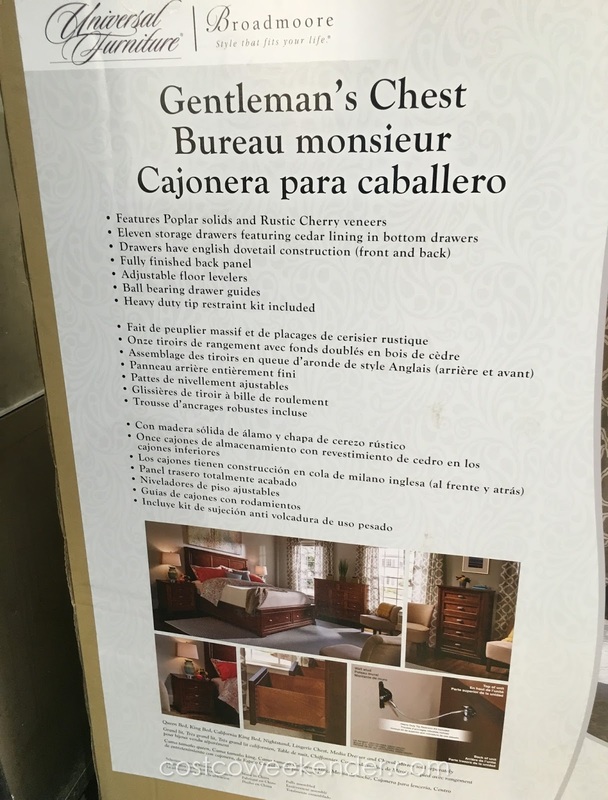 Thank you for sharing your experience with the Universal Furniture Gentleman’s Chest, @Anonymous. I hope the smell goes away sooner rather than later. I'm really surprised that Costco hasn't done anything in regards to carrying these products. Costco is usually pretty good when it comes to the quality of the products they sell.